** In a normal covalent bond, each of the two bonded atoms contributes one electron to make the shared pair. ** In some cases, a covalent bond is formed when both the electrons are supplied entirely by one atom. 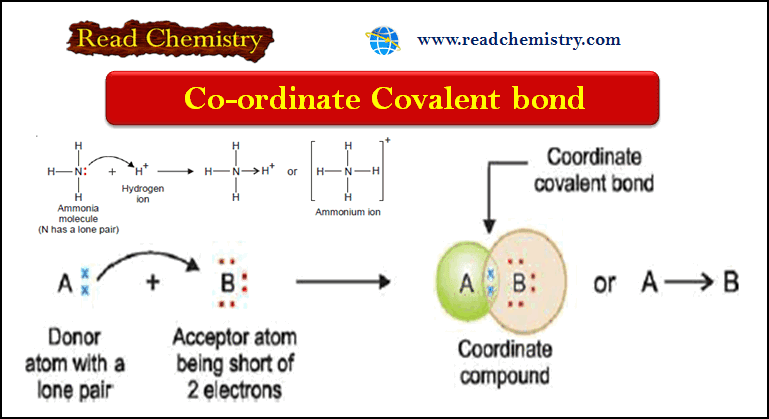 Such a bond is called co-ordinate covalent or dative bond. ** Covalent bond defined as: a covalent bond in which both electrons of the shared pair come from one of the two atoms (or ions). ** The compounds containing a coordinate bond are called coordinate compounds. ** The atom A which donates the lone pair is called the donor, while B which accepts it the acceptor. The bond thus established is indicated by an arrow pointing from A to B. Although the arrow head indicates the origin of the electrons, once the coordinate bond is formed it is in no way different from an ordinary covalent bond. ** The molecule or ion that contains the donor atom is called the ligand. ** In ammonia molecule, the central N atom is linked to three H atoms and yet N has an unshared pair of electrons. ** The H+ ion furnished by an acid has no electron to contribute and can accept a pair of electrons loaned by N atom. ** Thus, NH3 donates its unshared electrons to H+ forming ammonium ion. ** The oxygen atom in water molecule is attached to two H atoms by two covalent bonds. ** There are still two unshared pairs of electrons with the O atom. The O atom donates one of these pairs of electrons to H+ ion and the hydronium ion is thus formed. It is formed when a boron trifluoride molecule (BF3) shares a pair of electrons supplied by fluoride ion (F–). ** The N atom of ammonia molecule (NH3) has lone pair while B atom in boron trichloride (BCl3) is short of two electrons than stable octet. ** An addition compound is formed as the N atom donates its lone pair to B atom of BCl3. ** The Lewis structure of nitromethane is shown below. Here the N atom has five valence electrons, three of which are used in forming a covalent bond with C atom and two covalent bonds with O atom. ** The N atom is still left with two unshared electrons which are donated to another O atom. ** Sulphur achieves its octet by forming two covalent bonds with one O atom, giving SO. ** The S atom in SO has two lone pairs, one of which is shared with a second O atom to form sulphur dioxide, SO2. ** The S atom in SO2 still has one lone pair which it donates to a third O atom forming the sulphur trioxide (SO3) molecule. ** Aluminium atom has three valence electrons which it shares with three Cl atoms, forming three covalent bonds. Thus the Al atom acquires six electrons in its outer shell. ** Now Cl atom has three lone pairs, one of which is donated to the Al atom of another molecule AlCl3. ** Thus both Al atoms achieve octet and stable Al2Cl6 results. ** Sulphur has six valence electrons (2, 8, 6) and achieves the octet by gaining two electrons from metal atoms (say two Na atoms). ** The four pairs of electrons around the S atom are then donated to four oxygen atoms each of which has six electrons. ** Oxygen molecule is made of two oxygen atoms joined by two covalent bonds. ** Each O atom in O2 has two unshared pairs of electrons. When one pair of these is donated to a third O atom which has only six electrons, a coordinate bond is formed. ** Carbon atom has four valence electrons while oxygen atom has six. By forming two covalent bonds between them, O atom achieves octet but C atom has only six electrons. ** Therefore O donates an unshared pair of electron to C, and a coordinate covalent bond is established between the two atoms.